On Saturday, at around 10:30 am, Mannargudi-Bhagat Ki Kothi Weekly Express rolled into platform number 5 of Tamil Nadu’s Chennai Egmore railway station. Some parcels were unloaded onto the platform, among which were 20 thermocol boxes, and the train left the station to travel on to Mannargudi. As the 20 thermocol parcels were being unloaded, a particularly bad smell reportedly wafted out of them. Railway police officials on a routine patrol stopped the men who were placing them onto the platform. The men immediately dropped the boxes and fled from the spot, a report in the Times of India states. The RPF officials split the boxes open to find frozen meat of some small animals. The hooves and heads of the animals were cut off. The RPF officials immediately called up food safety officials. It did not take the food safety officials long to suspect that the meat could actually be slaughtered dogs, a source who was present at the spot told The News Mnute. Food safety officials say that the packed boxes weighed 2,190 kilograms and the meat was distributed across 20 boxes. 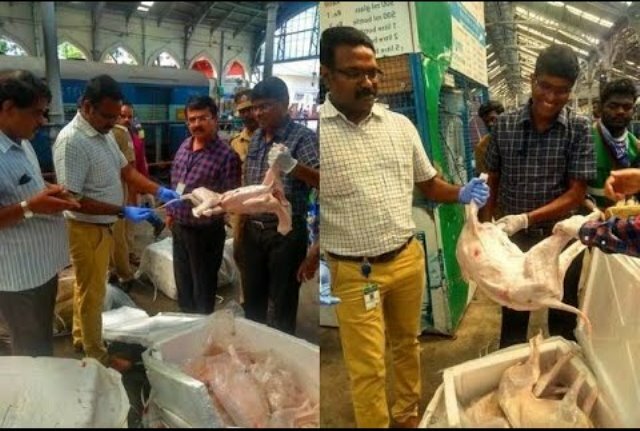 Speaking to TNM, Dr R Kathiravan of the Food Safety Department said that the cargo was marked as ‘fish’ and ‘meat’. “The meat was transported in thermocol boxes with ice. It was not in cold storage. Ideally, it should be frozen because the journey time is 48-72 hours. It is not clear who the meat was meant for and why such a large quantity was being transported,” he says. Owing to a jurisdictional overlap, the Food Safety Department has asked the Railway Police Force for details on the consignment. The Food Safety officials are examining whether it is goat or dog meat since there are some anatomical differences. Two whole animal samples have been sent to the Meat Sciences Department at the Madras Veterinary College in Vepery, Chennai. The primary concern for the Food Safety Department, however, is the manner in which the meat was transported. “It should have been in proper cold storage. The train doesn’t have such facilities. We don’t know whether it is healthy or not. Nobody has officially claimed the boxes either,” informs Dr Kathiravan. Based on the species report, the Department will swing into action. “This trade has to be regulated. We need to ask why such a large quantity of meat is being brought,” he adds. It is believed the parcels were booked by someone hailing from Gandhidham in Gujarat. The parcels were reportedly loaded on to the train three days ago. While the RPF officials have not lodged any complaint, an FIR has been registered by the police against unknown persons. The police are trying to trace the origin of the parcel and are trying to ascertain where or whom the meat was being sent to.